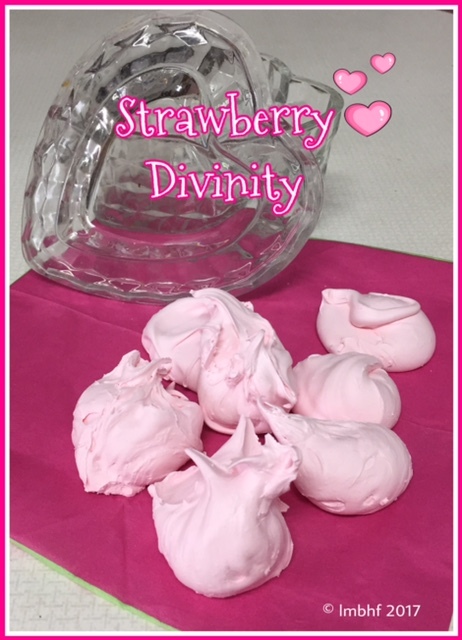 A Sweet Valentine Treat – Strawberry Divinity! January 12, 2017|Posted in: Holidays and Seasons, Let's Eat! This stuff is Devine! It is a Christmas tradition at our house, but works equally well as a Sweet Treat for Valentine’s Day! Mix together the sugar, water and corn syrup in a large sauce pan and bring to boil over a low heat. Stir mixture constantly until the sugar dissolves, then stir occasionally until mixture reaches 250 degrees (hard ball stage) on your candy thermometer. Meanwhile, beat together the egg whites until the mixture is stiff but not dry. Add the Strawberry Gelatin to the egg whites and continue beating until mixture peaks stiffly. Drop by rounded spoonfuls onto waxed paper and allow to set before eating. Make a pretty plate of the sweet treats for your favorite Valentine or share the Valentine love with the whole family! Looks tasty! I wonder if you could make it chocolate by adding chocolate chips or chocolate pudding powder or cocoa powder? I’m a chocolate addict 🙂 Thank you for partying with me at my very first Wednesday AIM Link Party. I shared your post on my social media sites.